Majority of users do not bother to check and configure font settings of a web browser. We just open weblinks and start browsing web content. 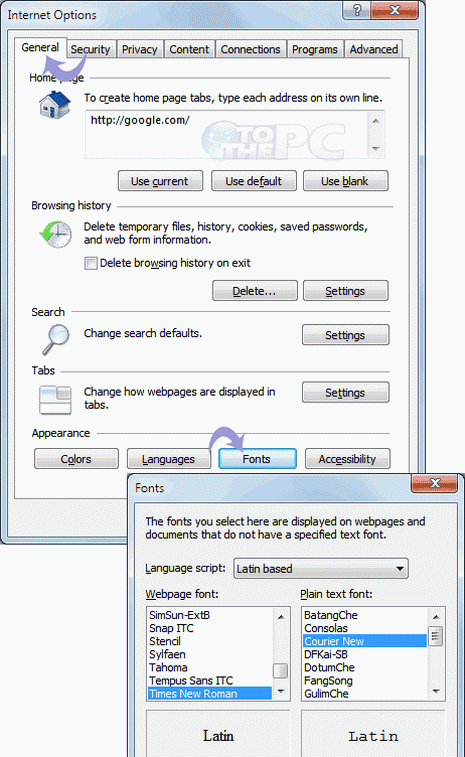 All modern web browsers allow users to change default text settings. You can configure to change default font type and size of text of either of web browser including: Firefox, Internet Explorer and Google Chrome. 1. Open Mozilla Firefox web browser. 3. Under the Content Tab, Click on Advanced option in Font and Colors section. 4. Select the font and size for the text that you want to see. 5. Also uncheck the option, allow the web page to choose its own font. 3. Under the General tab click on Font option located at the bottom of the window. 4. 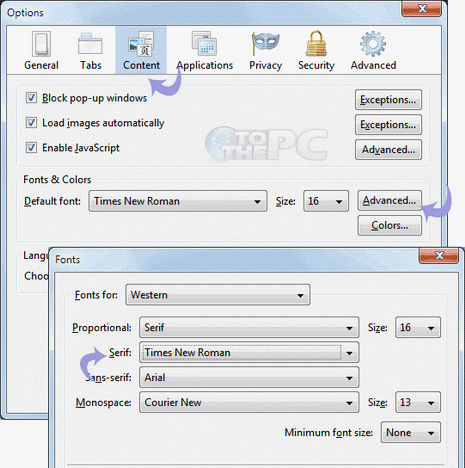 A window will pop up, select the favorite font and size of the text for your browser. 3. Go the Under the Hood tab and click on Change Font and Language setting. 4. A window will pop up from where you can choose the font and size for the text. This worked really well! At least, it did in Google Chrome. And IE 9. I love being able to make the font size bigger, and choose sans serif fonts that are easy to read. Your web site is full of good posts! I like it here. I saw your comment on Bing blog a few days ago, about Facebook-Bing links and privacy. Yes, I thought similarly as you.